Lynn and I have been 'talking teacups' this week. It all started when I saw the lovely Bridal Invitation card in her Zazzle shop (you can find the link on her blog). So we decided to have another of our own little challenges this week.....if you would like to join in just link back to us in the comments box and we'll come to see you! Above you can see my first version.....and to the left is the original photo. This is one of my favourite cups; it isn't very old - on the back it says 1996 "Florence" by Royal Doulton. I picked the rose from my garden yesterday...it was the very last one left on the bush. So I called my digital piece "The Last Rose of Summer". My second version has a clematis flower; we have a 'late' purple clematis climbing over an arch in the garden..... I can't believe it's still producing flowers. I love 'text textures' ;-) this one is free from Boccacino (Flickr). 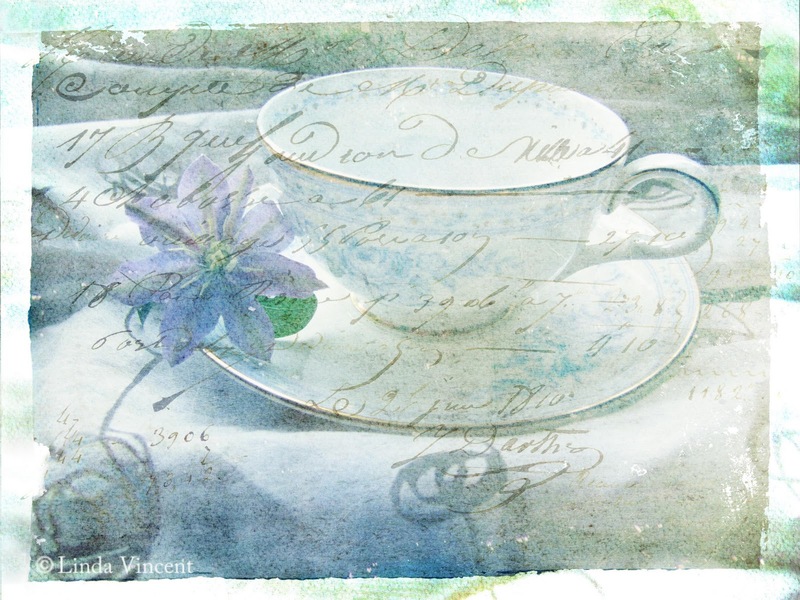 All the other textures and layers I've used are from Kim Klassen, Shadowhouse Creations and Playing With Brushes. Whilst watching Frances Pickering at Ally Pally last Saturday I spotted her embroidery threads all neatly organised on rings and thought I can do that!!! Lovely work Linda. That photo really makes me feel that our summer has ended. Cool way of organising, wish I was half as organised as you. "The Last Rose Of Summer" is gorgeous! I love how the gold trim on your beautiful cup shows up so well. The second one is also very nice. I just love what you are doing. And your embroidery threads looks beautiful as well. Oh wow Linda so wonderful digital art. Fantastic layers. I love it. Have a lovely weekend my dear friend. My threads look like your's used to and I have them all stuffed in a jar LOL. What lovely tea cups - how do you do that? Hope your embroidery threads will stay like that mine never do! Lovely digital art I particularly like the gold one. The threads look great in their colour combinations. Hi Linda,you are very talented in the manipulation of textures and digital picture.. I love the result.. it is so delicate and precious. So pretty - I especially love the top one, it looks so vintage. I am very impressed by your tidy threads, and even more so by your delightful teacup design. All the elements which make it up are so lovely and put together they create something really beautiful. Love your teacup pieces. How lovely to find those last flowers in your garden. I might try something like this except I don't like to use my printer, ink too expensive. My but your threads are so organized now! I wonder how long they will keep like that? Mine are more like your first photo but I do have them organized by color, stuffed into individual baggies. Good enough for me. Too many to organize as I have gathered a lot from other people and from yard sales. I'm working on using them up. Ha! 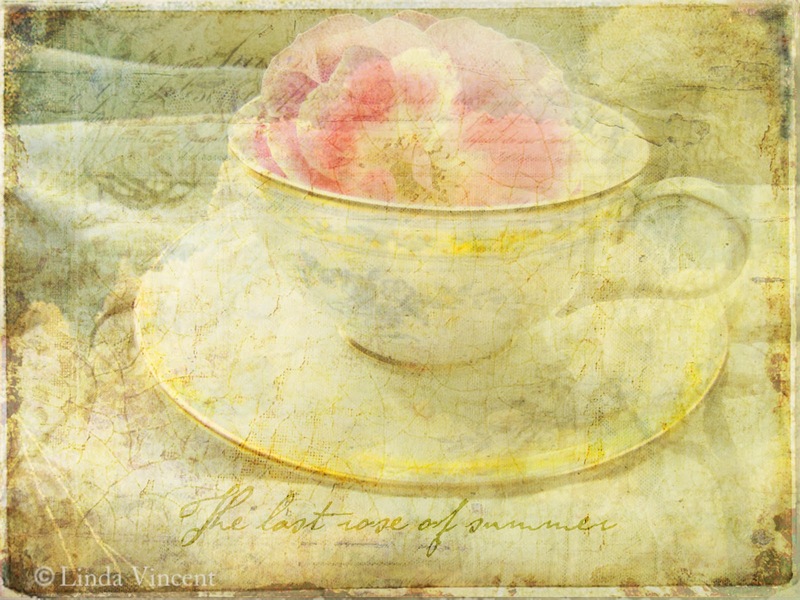 Stunning work with the teacups Linda , they look divine. Im absolutely loving all this digital work you are doing its delicious. How organised!!! and those threads look beautiful all carded like that on their rings (mmm...probably should organise my threads too, they are a mess). Cups and saucers are gorgeous. 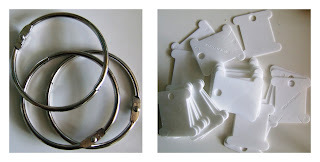 Have you seen the post of Grrl & Dogs blog on teacups? Through Anni (fabric art)I've just discoverd your blog and had to leave a short message ! Browsing through your blog was very enjoyable and I loved your digital entries ! The use of all the textures and the great additions...My compliments ! what amazing organization!! and I love the purchases you made below, just beautiful! cannot wait to see what comes of it all, it must have just been a marvelous show!! looks fantastic and so glad you had such fun!! Such a pretty teacup! You've got quite a collection of thread there...some lovely colors, too! Oh gorgeous silk organisation - I have my ribbons on something similar. Still loving all your digital work - you have such a gift for it. I'm simply in awe of what you've done with the photos--they are just so beautiful! I love your digital work here..they are really beautiful and soft. Lovely flower in a teacup & clever idea for sorting & storing. Really dreamy teacups. such a neat way to store your threads too. what a fabulous idea! a winter night project in front of a movie with my family...perfect! thanks, linda! And i like your idea on organised those thread. That looks good Linda ! Nice for my holiday when we go to Portugal later this year . Beautiful, beautiful tea cups Linda. You always add your special creative touches to any projects. And my, oh my how organised your threads are! Mine are a jumbled mess he hee..
the teacups are lovely, but the embroidery floss all wound up like that? *drool* beautiful.